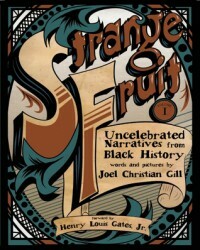 Strange Fruit, Volume I is an anthology showcasing nine African Americans whose names and stories are little-known in the annals of American history. for the first time, author/illustrator Joel Christian Gill shares their neglected biographies through vibrant, colorful and humorous artwork and commentaries. his drawings are pleasing to the eyes with his liberal use of cool hues that are complemented by splashes of warm and earthy tones. more than the historical and cultural components, the stories reflect the triumph of man's indomitable spirit against the many faces of adversity. there is Henry "Box" Brown who mailed himself to Philadelphia to escape from slavery; Marshall "Major" Taylor, also known as the Black Cyclone, who was the first black champion in any sport; Bass Reeves who, with the help of his Native American friends, captured a considerable number of outlaws and was hailed to be the most successful lawman in the Old West. these are but three of the nine African Americans one gets to read about in this volume. this collection is readable, engaging and informative. it will surely appeal to readers both young and old. i will be on the lookout for more strange fruit in the future to sink my teeth into and i hope you enjoy these uplifting stories as much as i did.